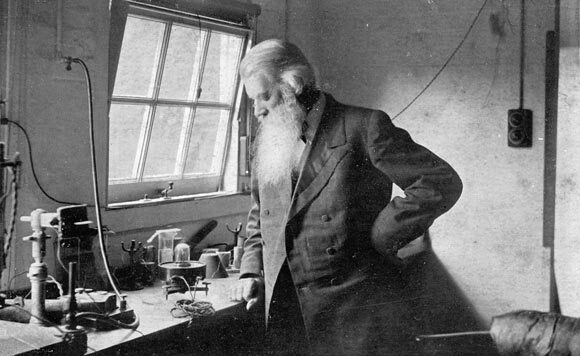 Sir Joseph Wilson Swan was a British scientist of the 19th and early 20th centuries, who is famous for inventing the incandescent light bulb. He was born on 31 October 1828 to Isabella Cameron and John Swan. He was a curious child and took to intensive reading and attending lectures. One of his earlier business endeavors was being a partner at a firm of manufacturing chemists. Swan began experimenting with electricity and in 1850, he started to develop a light bulb made of carbonized paper filaments placed inside an glass bulb. By 1860, he was ready to demonstrate his working device and managed to obtain a patent for it. However, the equipment needed to create a vacuum was inferior and Swan’s light bulb was of poor quality and had a short life. He continued to make improvements to his original creation and with the help of a better vacuum and use of carbonized thread as a filament, he was able to develop a better version of his original creation in 1875. Because of the limited presence of oxygen inside the glass tube, the filament could glow at high temperatures without the danger of combustion. It needed heavy copper wiring as the filament was of low resistance. This incandescent lamp was first publicly demonstrated by Swan at his lectures in 1878-79, to a steadily growing audience. He obtained another patent in 1880, for using “parchmentised thread” made from cotton as a filament in the bulb. In the same year he formed “The Swan Electric Light Company Ltd” to manufacture incandescent light bulbs for private and commercial use. Swan’s home in Gateshead was the world’s first home to have electricity. He then began installing bulbs at various public locations; for instance, the Lit & Phil Library in Westgate Road, Newcastle was lit during one of his lectures and the Savoy theatre in London became the first public building in the world to be lit entirely by electricity. This greatly enhanced the experience and enjoyment of the theatre going public, as the heat and odor produced by gaslight would often cause suffocation due to lack of oxygen inside theatres. Swan also developed a safety lamp for use by miners, which was improved in the subsequent years by others before being fit for widespread use. Swan’s main competitor in America was Thomas Edison. The two had neither met, nor spoken to each other before the invention of the incandescent lamp. Their work was entirely independent, although each was aware that the other was directly involved in the same line of work. Edison was trying to improve on Swan’s original version of the incandescent lamp and Swan allowed him to hold the patent for manufacturing and distribution in the United States, while he held the same in Britain. In 1883, however, Swan’s and Edison’s companies merged to form the “Edison & Swan United Electric Light Company”, commonly referred to as Ediswan. The company mainly produced and sold cellulose filament bulbs invented by Swan in 1881. Joseph Swan also contributed to the development of photography by developing a feasible process for carbon printing that allowed photographic prints to be made. He also invented the dry plate process as well as bromide paper. All in all, he held over 70 patents in the area of photography alone. Swan was elected to the Royal Society in 1894, and also presented with the Royal Society’s Hughes Medal in 1904, the same year that he was knighted. He died in 1914 in Surrey at the age of 85.